Last weekend, the farmer’s market was brimming with bright green bunches of fresh asparagus and the temperature was expected to hit 70 degrees. 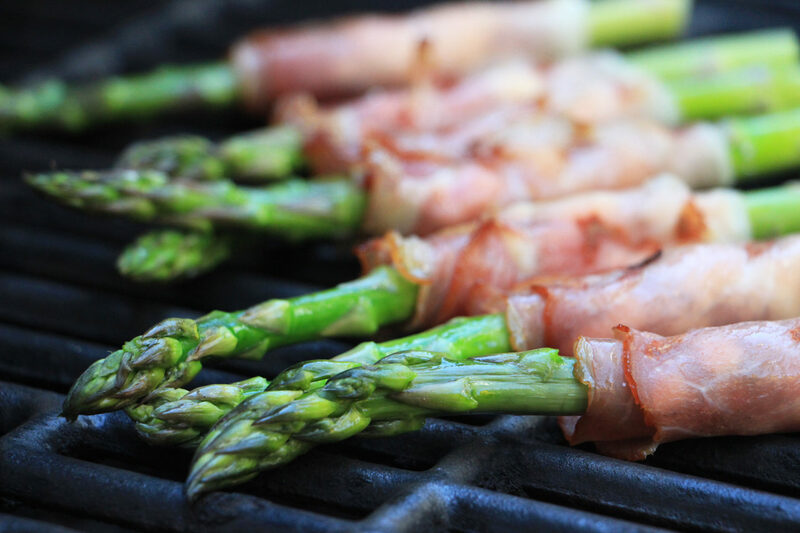 I bought a bunch of asparagus and dragged our grill out from its winter hibernation to try a recipe I’ve been eyeing for months: Santa Ynez Inn’s Chevre and Prosciutto Grilled Asparagus. 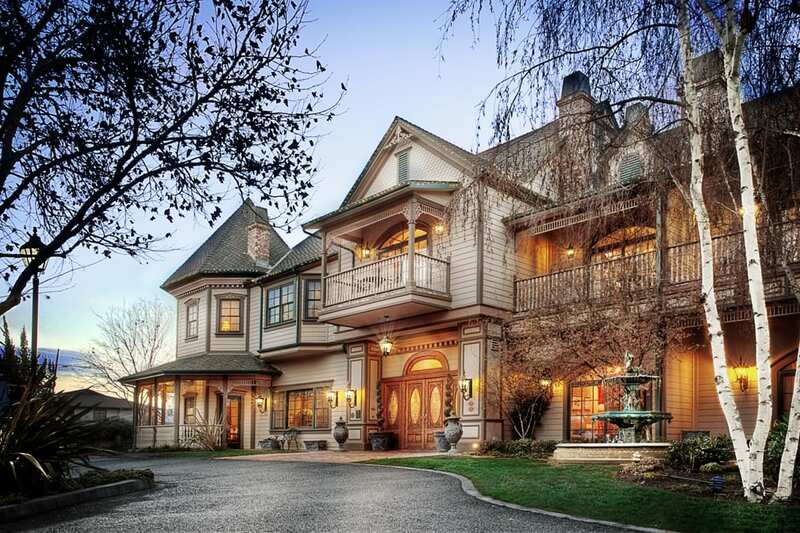 The inn sometimes serves the appetizer as part of its nightly wine hour, in which they pour local Santa Ynez Valley wines paired with cheese and light bites. 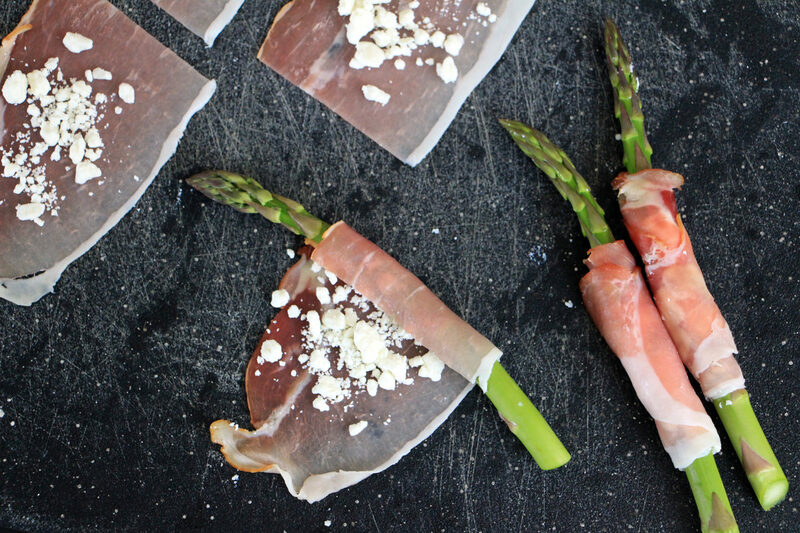 The prosciutto-wrapped grilled asparagus is always a hit among their guests. Spring is the prime season for fresh asparagus and this elegant, savory appetizer is a cinch to make at home. 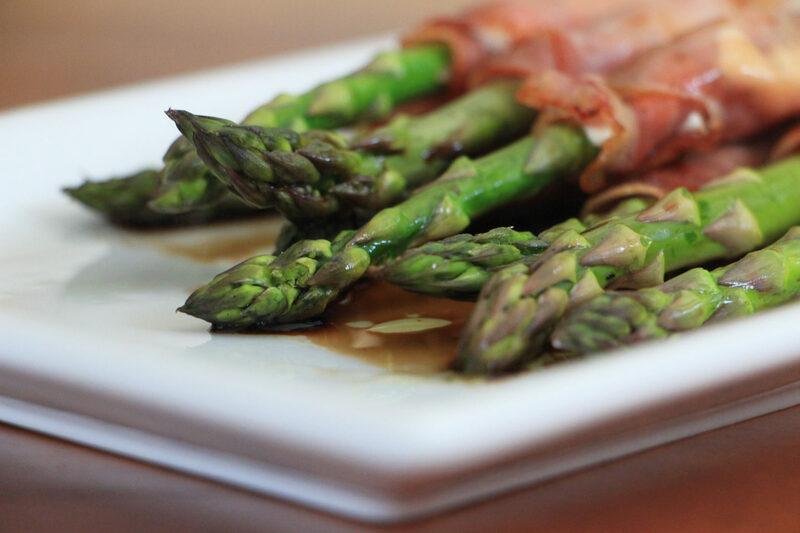 It requires just a handful of ingredients: asparagus, cherve (goat cheese), prosciutto, balsamic vinegar, and extra virgin olive oil. 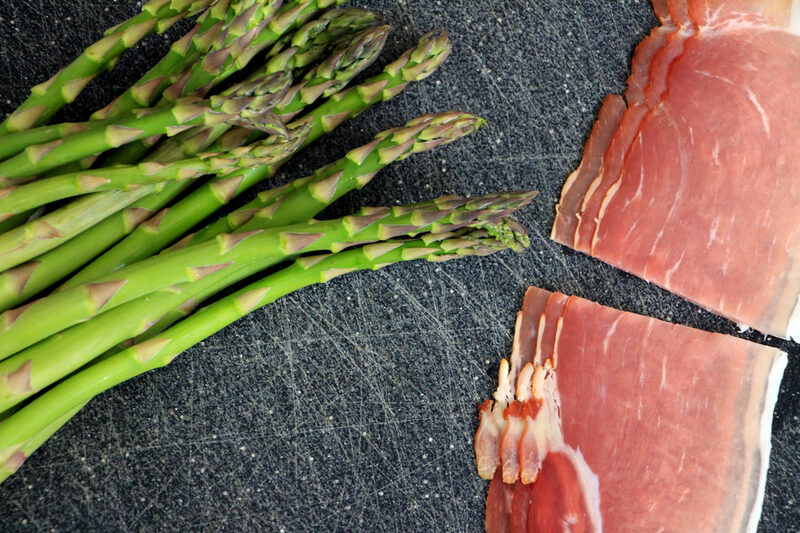 To assemble, I spread a small amount of cherve on a half slice of prosciutto and then rolled it tightly around each spear of asparagus. I placed the wrapped asparagus spears on a hot grill for a couple of minutes and then plated them with a drizzle of balsamic vinegar and extra virgin olive oil. My husband and I stood in the backyard next to the grill and quickly gobbled down our first taste of spring. Preheat grill on high. Cut each prosciutto slice in half, down the center. Wash and cut the asparagus spears, reserving the top thirds. 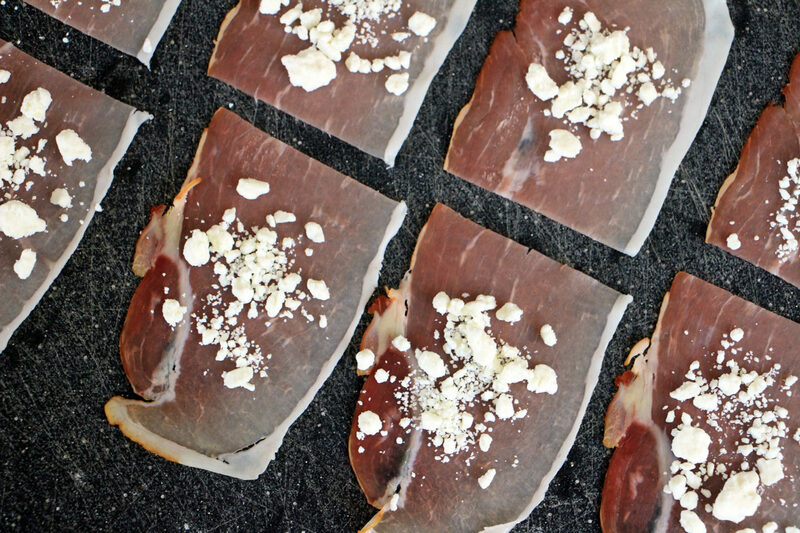 Spread a small, even quantity of chevre onto the prosciutto. Wash and trim the asparagus and the cut each prosciutto slice in half, down the center. Place one or two asparagus spears (depending on thickness) on one side of the prosciutto and gently roll the prosciutto tightly around the asparagus. Once finished, coat each spear lightly with cooking spray. Grill on high heat for two minutes or just until the asparagus turns a bright shade of green. Drizzle balsamic vinegar and olive oil onto a serving plate. Arrange the asparagus and serve immediately.